The Institute for City History in Frankfurt am Main houses one of the most important European city records and in 2011 can look back at a 575 year old tradition, to the year 1436 when the first city archive building "Turm Frauenrode" was opened. The legal documents which are kept in the institute date even further back in time. 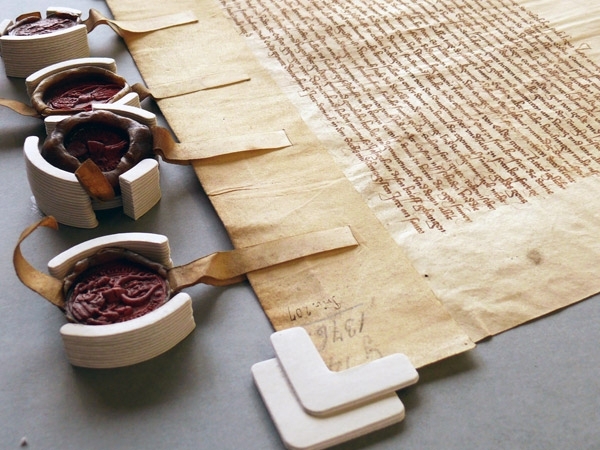 The oldest stored document was issued by Emperor Karl the Fat in the year 882, in which he donated land to the Bartholomäusstift Frankfurt. The “Privilegien” are the city’s most important collection of documents and define the most important rights and privileges of the city, and are provable in this way. The approximately 750 documents were made in the most diverse ways, mostly however existing in the classic form of parchment with pendant wax seals, were most likely to have been packed in custom made boxes by a bookbinder in the 19th century. The boxes were made of unsuitable heavily acidic straw board and were also covered with a black fabric. 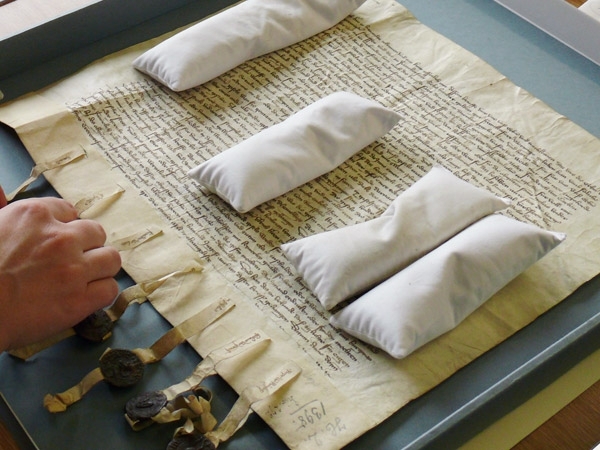 The legal documents were often folded extremely small and then covered with inadequate paper tubes or even linen bags. In the length of time, vast amounts of dust had filtered through the air holes in the boxes and grimed the seals and legal documents. 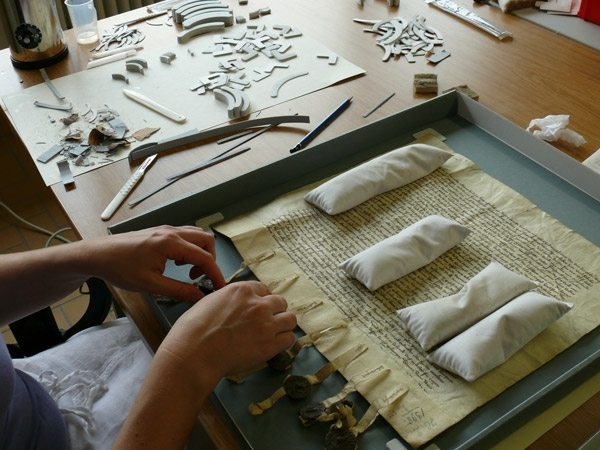 Having just installed a new conservation studio and employed a trained conservator, it was decided on the conservational treatment of the “Privilegien” documents and to re-house them in archival boxes. The legal documents should be unfolded if possible, and mounted flat into fitting boxes. Searching for a suitable packaging solution, one decided to use trays in single boxes with a telescope type lid, even if this method is not as space saving, as storing the trays one above the other in a shelf type box. Given that the documents are being borrowed and taken out regularly; transporting the objects in separate boxes is more preserving. One side of the box should open in order to comfortably pull out the tray. 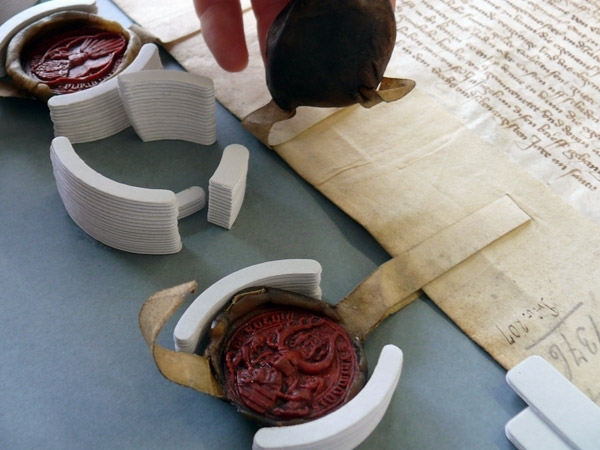 Due to the assembly on the tray, the documents and especially the delicate seals are protected from skidding around and can still be submitted for use. As a first measure a member of staff created a list in which all measurements of the documents and seals including sealing cords were listed and based on these measurements it was evident how large the individual protective containers should be. On the basis of this list one agreed to three box sizes. A more accurate fitting of the boxes would have required a too large measurement effort and subsequently have also caused problems with storing the boxes upon each other. In addition the price of a larger number of the same box sizes was cheaper than to reset the machine again and again. Further on there is the question which material to use. Solid board has advantages over corrugated board, in particular with regard to stability and durability in damage scenarios. However, since some boxes turned out quite large, solid board would have been very heavy and the handling of the boxes would have been more difficult. Solid board also tends to sag if too large, which would have resulted in the touching of the documents and seals. So one decided to use boxes made from corrugated board, covered with blue archival paper to protect the box surface from becoming soiled. After obtaining several offers we found a competent partner. 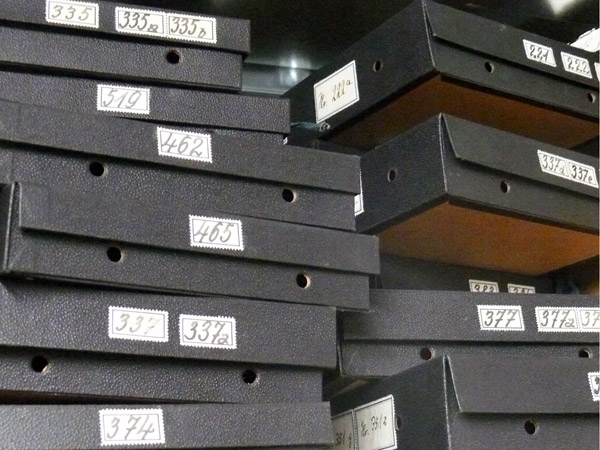 KLUG-CONSERVATION had made a valuable offer to the institute of city history and expertly managed the conservation project from order to delivery. Having solved the problem with the archival boxes and after they had been delivered on schedule by KLUG-CONSERVATION, we began with the conservational handling of the documents. The documents were taken from the old containers, unsuitable more modern protective seal containers made of board or linen were removed, but contemporary wooden or metal containers were kept naturally. Included old user lists, were sorted out, these are evaluated by the archivists at a later date, as they may contain interesting contemporary historical information about previous archive users. 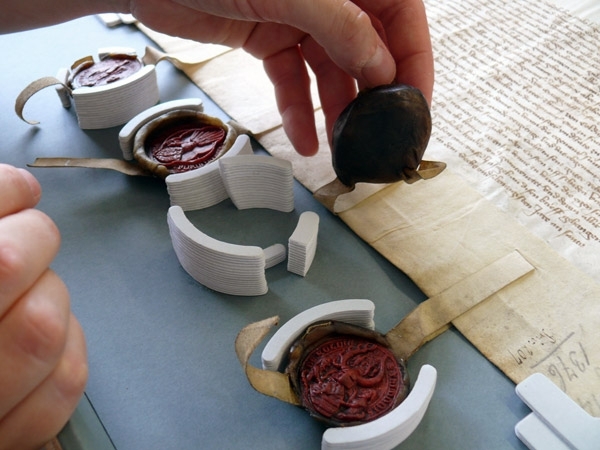 The documents and seals were carefully cleaned with a latex sponge, paintbrush and a soft brush. Slightly folded or small unfolded documents were mounted flat without further treatment. Strong crumpled documents were acclimatised in a moderately moistened humidifying chamber (about 80% to prevent an excessive swelling of the parchment) in order to lay them out flat using glass plates at the edges only. Here, particular attention was given not to smooth out the creases too much so as not to damage the parchment. Due to a subsequent longer drying time, the organic material parchment had enough time to adapt to the new circumstances. Thereafter, followed the mounting of the documents on the protective card board tray. We fixed the documents with glued overlaying angular segments, the seals got a firm hold by the seal “bananas” fixed on the same height and the surrounding scored cardboard strips. Technical gelatine was used as an adhesive, firstly because it bonds quickly and the mounting could be made in a shorter time, secondly because this adhesive has proven itself in the restoration and no harmful interactions with the original materials are to be feared. We fixed very large documents with mylar strips, led them through a slit in the tray and attached them at the back with Lascaux glue. We fixed labels or photos of the document, which were sometimes included in the old containers, in the board lid with Japanese paper foldings and wheat size or gummed paper photo corners. With the conservational treatment and the ageing-resistant packaging one has created the basis for the proper long-term storage of this valuable document collection. Report by Mrs. Jana Moczarski, Institute for City History – Frankfurt am Main, from December 2011. Since 2012 she leads the restoration department in ZFB-Zentrum für Bucherhaltung, Leipzig. Please click here to download the digital version.